World Fine Art Professionals and their Key-Pieces, 74 – Joan Miró | Marbella Marbella – Adelante! 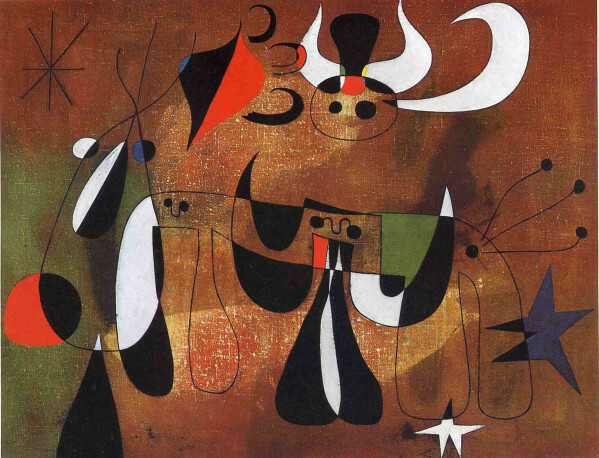 Joan Miró is considered one of the big three of the Spanish twentieth-century modern art, alongside Picasso and Dali. In Paris he developed his biomorphic painting, under the influence of the surrealist writers and painters. That style has become his signature, but made no school. Miró is known for his original, ‘ideogrammatic’ forms. On his canvases you see a playful and colorful variety of mostly organic forms. The color blue is common and in addition the basic colors red, black, green and yellow. The colored areas, bordered or crossed by black lines, usually have clear outlines. 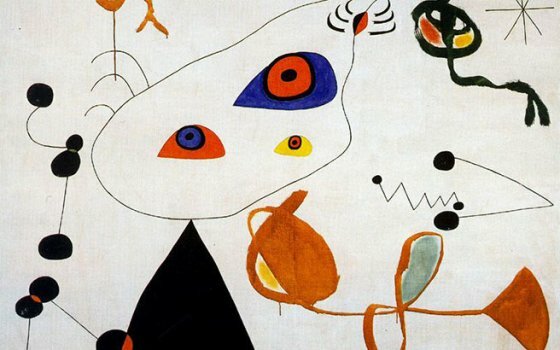 Miró’s unrealistic shapes, bright colors and lines resemble children’s drawings. 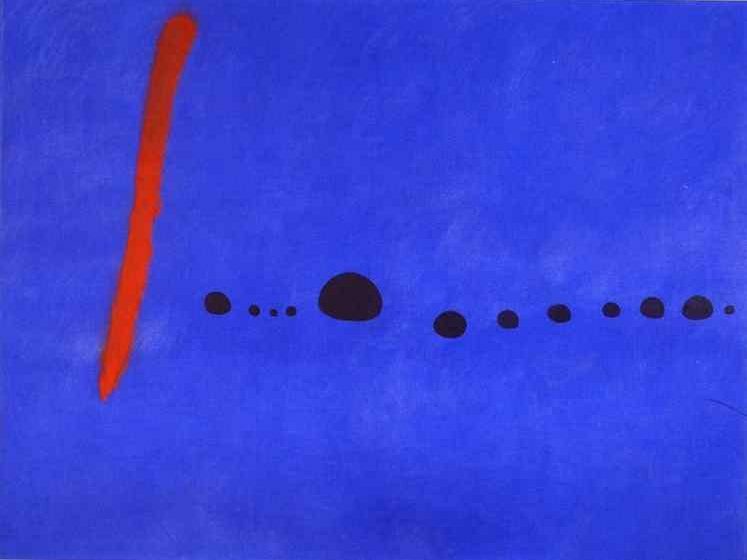 By using these shapes Miró indeed tries to go back to the origin of drawing. In his work there is a number of recurring themes such as celestial bodies and ladders. Many images have eyes. In this way, the painter tries to achieve direct eye contact with the person who looks at it. 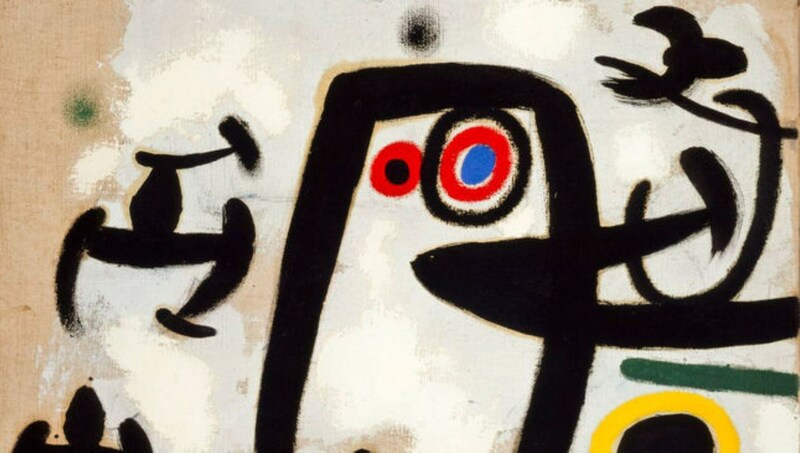 Miró signs his work, but paints not only his name. His name is always part of a little artwork. Sometimes he puts the four letters of his name neatly beside each other, sometimes he puts, as in the Chinese script, the letters under each other and on other works, he throws everything up or he hides letters among other letters. 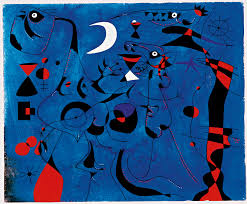 Joan Miró was born as the son of a clockmaker, jeweler and goldsmith on April 20, 1893 in Montroig, near Barcelona. As a child he drew a lot and since he was seven he took drawing lessons. He went to Trade school to please his parents, but he combined it with art education at the Art Academy La Longa, also written La Llotja, Escueleas de Bellas Artes Barcelona. Picasso also attended this school. He learned to portray objects precisely. Abstract art was rejected by the academy. At 17, having finished school, he was a bookkeeper for some time, but got a nervous breakdown from it. He decided to focus on art. He starts to study with the artist Francisco Gali, who had his own academy. Here he got the possibilities he didn’t receive at the Esuela de Bellas Artes. Gali showed that a realistic image was not the only image. He placed an object in a closed box and the students had to feel through a hole what it was. And then they had to draw it. He took this further and made drawings with his eyes closed. And he made his first oil paintings. He visited exhibitions of the Impressionists, Fauves and Cubists. He was not quite satisfied with his own fabrications and started to improve his technique. His sense of color and form is already there. He paints paradisiacal landscapes in a realistic style, but gradually he leaves the depth. Till there are completely flat compositions. Of fauvism he takes on bright colors. He liked to be with his family, in the countryside around Montroig. He was inspired by the Catalan country life. He wanted to show the ‘Catalan feeling’ and give it a boost. But he was also attached to Majorca, where his mother came from. Besides landscapes, you can find back in the works of these years the special light and folk art. In 1918 he has his first solo exhibition. With some friends, he founded the Agrupacio Courbet, with the intention to react against the Barcelonese conservative art world. He made a trip to Paris, where he befriended Picasso, who received a ‘self portrait’ of him. Two years later he moved to Paris and experiments are plenty. Including Cubism and DaDa. He has a lot of contacts with like-minded artists and writers and draws much inspiration from poetry. He doesn’t earn a penny. Influenced by the Surrealists he develops his biomorphic painting. He took classes at the Académie de la Grande Chaumière. Early twenties he starts to put tiny cubistic elements together. An example is ‘The Farm’, from 1921/22. His realistic periode is definitely over. Strange creatures emerge, which he alledgedly saw during hunger hallucinations. He maintains close contacts with André Breton and other surrealists and signs the Surrealist Manifesto. 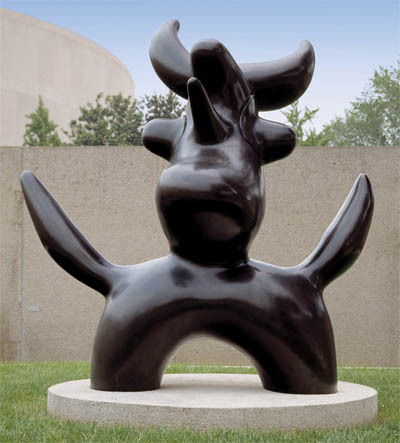 In his work we see colorful geometric shapes and figures that seem to float. 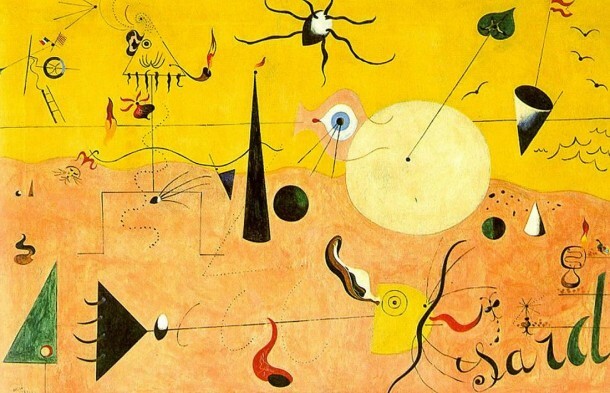 The paintings took shape while painting, entirely according to the principles of surrealism. 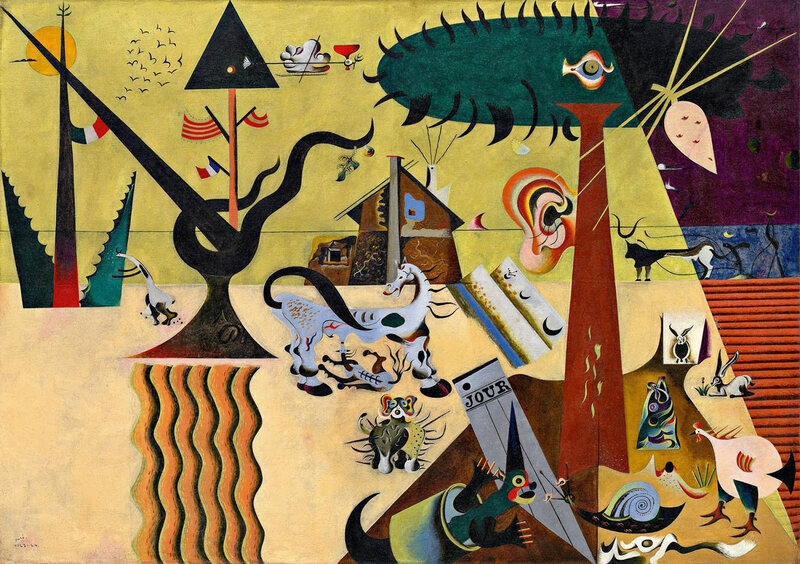 In 1925 he participates in the first exhibition of the Surrealists. In 1926 he designs, with Max Ernst, the sets and costumes for the Ballets Russes of Diaghilev. In 1928 he visits the Netherlands, where he was very impressed by Vermeer. He copied him, in an abstract way. In 1929 he marries Pilar Juncosa and two years later daughter Maria Dolores is born. In the thirties he experiments further and makes collages with paper, wood, sandpaper and copper. In 1930 he has an exhibition in Brussels, Paris and America. After Barcelona has been given more autonomy, he goes back. Out of the his collages come large paintings with rounded, interpenetrating shapes in red, black and white. He worked on ‘automatic inspiration’ and puts toys, machine parts and other objects in a row waiting for ideas to come up in his head. In the Spanish Civil War (1936) he makes pain contorted, monstrous figures in dark colors, the ‘peintures sauvages’. He takes all kinds of materials in his paintings. He returns to Paris and stays there until 1940 and writes poetry and prose. He has no room to paint. In 1937 he designs the murals for the Spanish Pavilion at the World Exhibition in Paris. He also makes posters for the republic Spain. In 1940 he moves to Normandy, where he is impressed by the dramatic cliffs along the coastline and the beautiful horizon. He starts with his Constellation series. When he sees the Germans invade France, he flees to Spain. During the war he works primarily on paper due to material shortages. In 1942 – he now lives in his native home – he makes 50 Barcelona lithographs that connect to the dark work of the thirties. He also makes gouaches in bright colors. In 1944 he makes with Josep Llorens Artigas his first ceramic object. Soon bronze sculptures and terracotta sculptures follow. After the war, he wants to commercialize his art so that he can build a dream studio. He is then working with graphics, ceramics, sculpture and finger painting. In 1947, he goes for the first time to America where he works on big commissions for hotels and universities. In the fifties he is known to a wide audience, especially by his lithographs. He wins a prize for graphic art at the Venice Biennale. With Llorens Artigas, he makes two ceramic walls in the UNESCO building in Paris. In 1956 he moves to his dream studio in Palma de Mallorca. He is involved with ceramics and sculptures. It is a humorous mix of objects and colors. The city of Barelona calls 1968 the ‘Miró Year’. 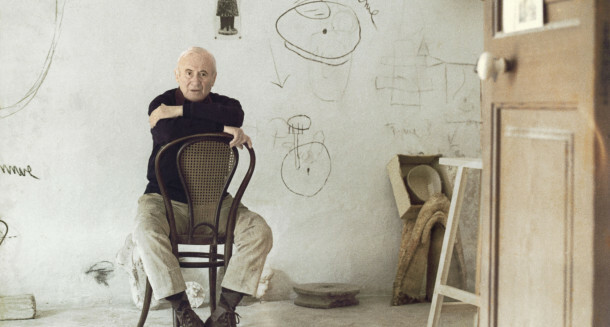 Architect Josep Lluis Sert, an old friend of Miró, makes the design of the museum which is opened in 1976 as Fundació Joan Miró Museum. When he is 80 in 1973, he receives numerous honors. He does many large commissions, including Madrid, Chicago and Ludwigshafen. 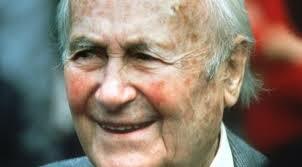 In the winter of 1983, he is 90, his health deteriorates. He is buried in Barcelona. His work features in several museums around the world. In the Netherlands he inspired various artists such as Constant, Piet Ouborg, Anton Rooskens and Jan Nieuwenhuis.